Finally the birds are singing and Spring will be here soon. It was an appropriate day to create a project involving birds! Here is one of Cassie's finished pictures. Very cute! To begin, you'll need some brown paint and some cardboard pieces for the branches. Corrugated box cardboard works nice for thicker branches. 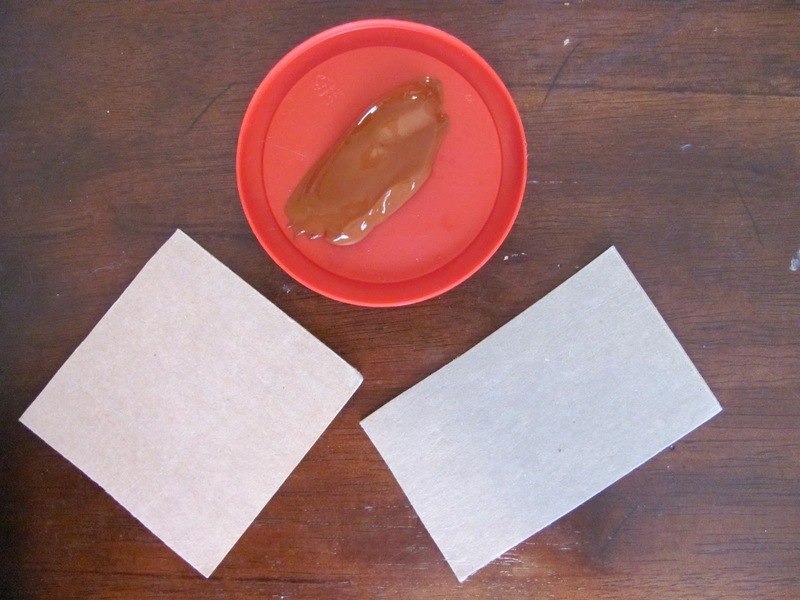 Use the side of the cardboard dipped in brown paint to create the branches of the tree. We used a potato cut in half and in half again (half circle) to print the birds body. We used red paint on a lid to print in. You could use blue too or any color you desire! Cassie really enjoyed the potato printing part! She made a lot of birds! I had to tell her to stop after a while! Then we simply used our finger to create the heads of the birds. Next, using the end of a small piece of cardboard, we twisted it to create a triangle bird tail. Cassie did very well with creating the tails!!! After the tails, we added the eyes, beaks, and feet with a small paintbrush. Lots of work!!! Almost too tired to finish!!!! Especially with all these birds!!! Lastly, we added a nest!!! We used pine needles that Cassie loves to collect, leaves, craft feathers, and some twine. I told her that many of the materials we used are also what birds use to make their nests---along with mud too! (We used glue instead!) 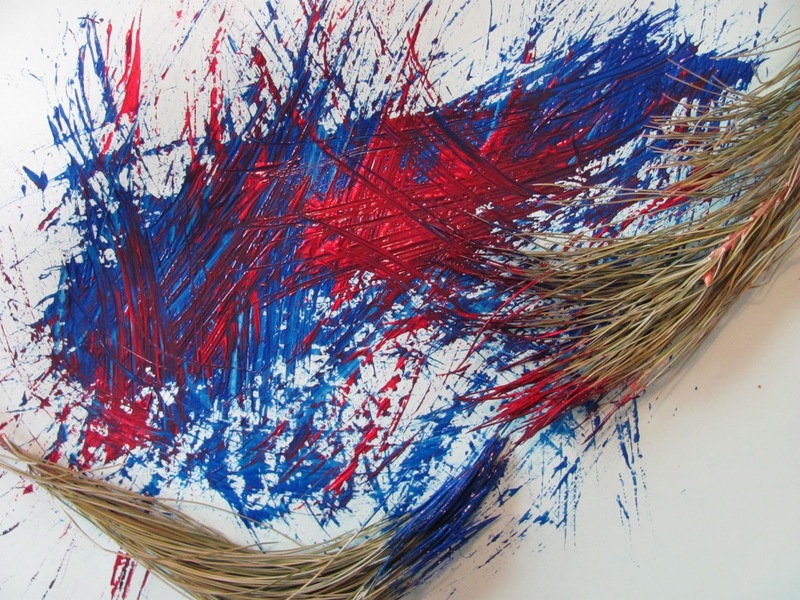 You could also use raffia, straw, grasses, or anything that you can find! Make a nature hunt out of it!!! It seems that Cassie is always on a nature hunt and has some collection stored away (rocks, pine cones, leaves, seed pods) so it wasn't difficult to find inspiration! We put a bunch of glue and arranged the materials to create the nest! All the birds are coming out of the nest. Ready to fly! Fabulous! 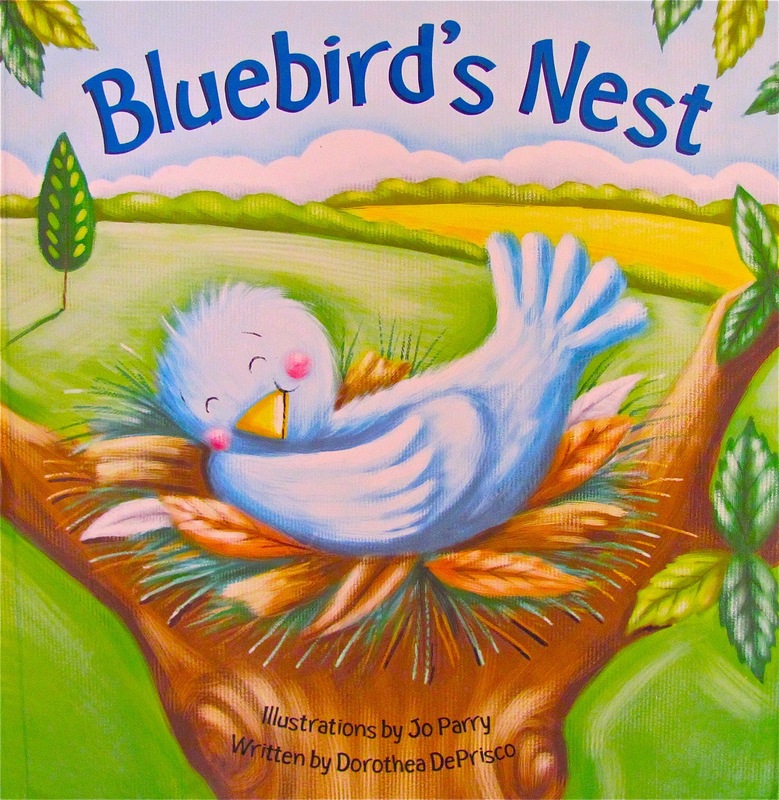 Now, if you want your picture to go along with this book: Bluebird's Nest by: Dorthea DePrisco, then make the birds blue!!! 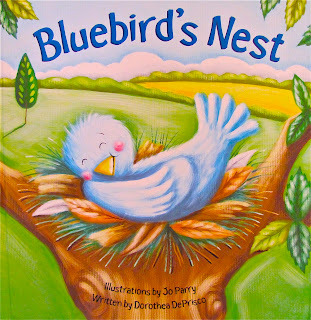 This is a great pop up book of a bird creating a nest----so cute!!! 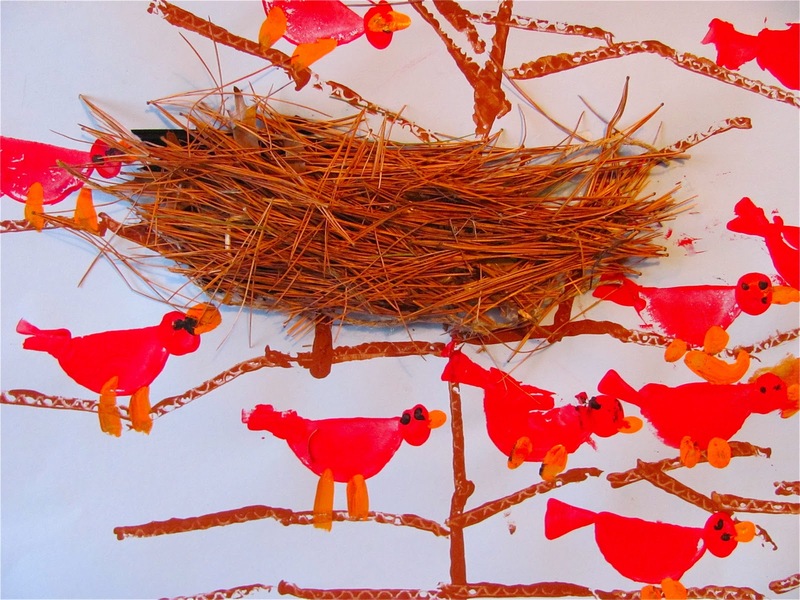 They used bendy pine needles, feathers, leaves and bark to build the nest in the story. Cassie loves this book! Which one do you like better? Cassie said, "I like the red birds and the blue birds!!". Well said. Another idea! Since we had some pine needles and paint left over.... we had a little fun with painting with them! I think it looks really neat. 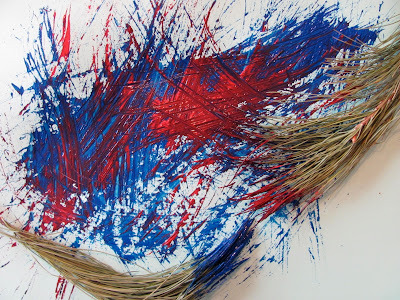 You could paint a nest this way!!?? What do you think??? Any ideas??? Your daughter did a brilliant job - I love all those birds (and her enthusiasm). Wow! What a great work of art-- and we're fond of the pop up books too! I am also going to check out the book! I want to look for this book too. The blue birds and red birds are super cute. These birds are just exquisite. I love the process, and that you take time to teach Cassie various ways to create each part of her birds. I love painting with non-traditional materials. What great ideas! ohhh loving that painting. I'm sure my little ones will love trying out this cool painting. fits in really well with our spring and gardens theme!! What a great blog. Call me your newest follower, I'll be back often for ideas to entertain and challenge the children I work with. Thanks for all the great comments! I am excited for our next projects! Thanks for checking in with me on my blog. I was just wondering if it is difficult finding me, now that I have the 2 blogs? I DO love this art Cassie did, and that you are helping her develop skills - scaffolding for her. I am thinking of doing a form of this with my 2 1/2 year olds. Just popped over from Helping Little Hands - what lovely ideas you share on your blog. I used to make potato prints with my children when they were young...now that I'm a grandma, I think it would be fun to do again! So cute! I featured you again. This looks like so much fun. I must bookmark this and remember to make it with the kiddos. They would love it. this is wonderful, melissa! 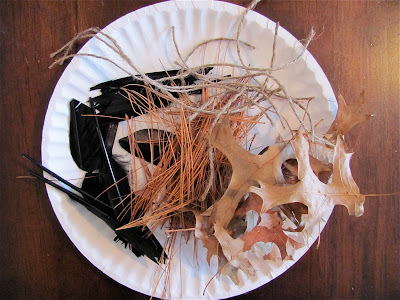 your use of found materials is inspiring: potatoes, cardboard, yogurt lids, fingerprints, pine needles, etc.! my daughter says the exact same thing when i ask her if she prefers "x" or "y". so funny. and, as usual, i love cassie's head dress. she's so stylish! Love all the busy birds! The addition of the nest is perfect, too. Beautiful art project. We did something similar but not as detailed with thumbprint painting bees and flowers. The birds are so cute! I had to try it myself today and I am going to involve my firstgraders next week. I found you through Adventures of Bear and I'm SO glad I did. I can't wait to sift through your archives and follow you. I love this project. So nice! Oh my gosh, that is so sweet!!! What a great idea! Love this, and especially all the different shapes that you printed in one piece, fabulous! Thanks so much for sharing on Craft schooling sunday! This is the cutest thing ever! I can't wait to make this with my little ones. I think I'll add that book to our library list, this week! My kids are absolutely fascinated by what nests are made of. So this would be a huge hit at our house. This is awesome...more than awesome! Linking crafts to books is great I think. Classrooms have so many of them! The twiggy bits really make the picture look real! Hope you will link again next week! Hi, I visit your blogs and read your content. Your content and blogs are very nice. The Bookmarks printing are uses to institution for business. I am impressed with your services. Really great post, it looks like a lot of fun and I think I'll getthek ids to do this over the weekend.